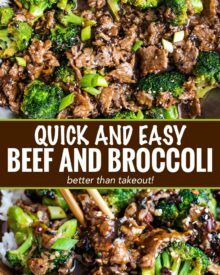 Perfect Chinese takeout-style Beef and Broccoli, made in about 30 minutes, right in your own kitchen! 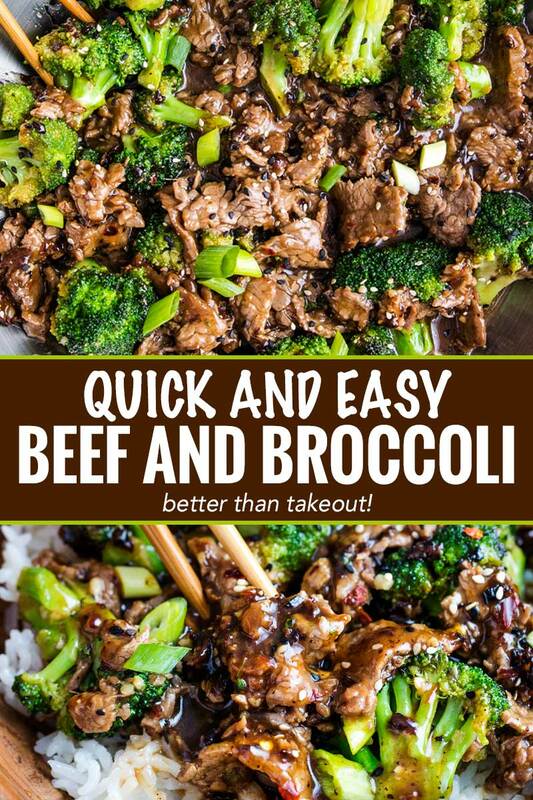 Put down that takeout menu… you can make EVEN BETTER beef and broccoli yourself! When you order takeout from your favorite Chinese restaurant, do you have a favorite dish? 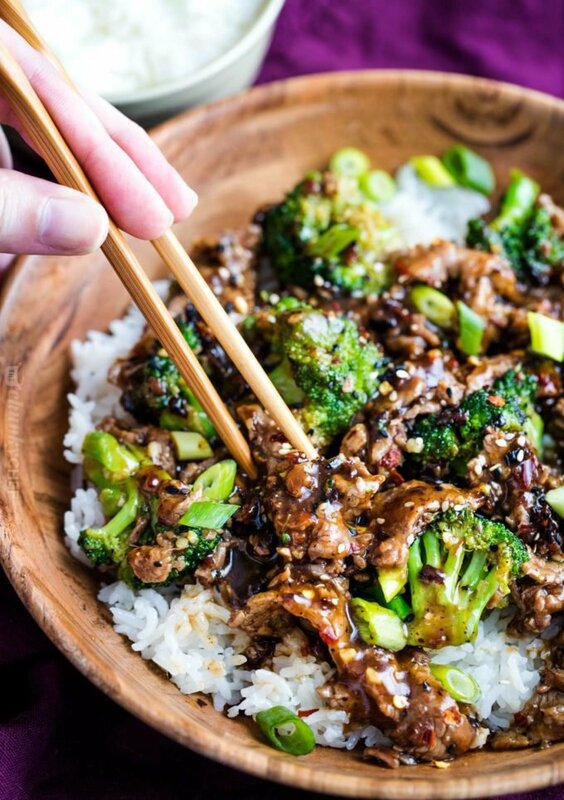 For me, it’s a toss-up between cashew chicken and beef and broccoli. Lately though, it’s been beef and broccoli stir fry just about every time! 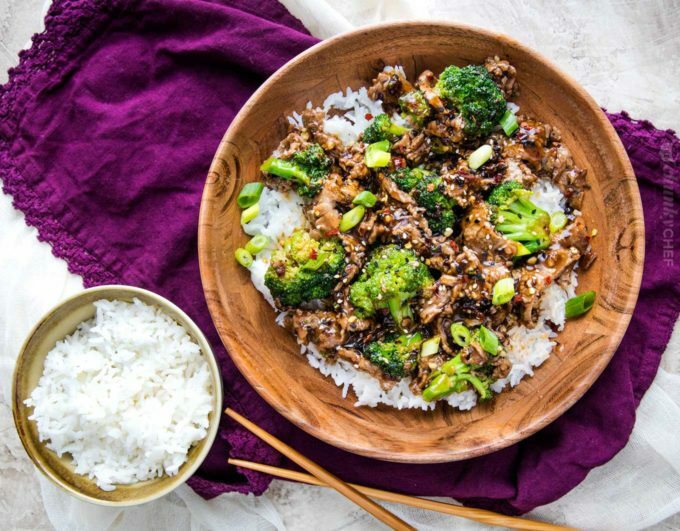 There’s something so ridiculously fabulous about the combination of sweet, savory and spicy in this easy beef and broccoli recipe! This beef and broccoli sauce just can’t be beat. But what I love more than the flavor combination, is how easy it is to make. WHAT CUT OF BEEF IS BEST FOR BEEF AND BROCCOLI? 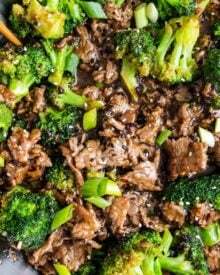 I’m a big fan of using flank steak for homemade takeout-style meals like this beef broccoli recipe or my famous and Slow Cooker Mongolian Beef. Once it’s cut properly, flank steak becomes so melt in your mouth tender! To properly slice flank steak, you’ll need to examine the meat first. You’ll see lines running along the length of the beef. That’s called the grain, and it looks very similar to the grain on a piece of wood. If you cut alongside those lines (or WITH the grain), the steak becomes very tough and chewy. So instead, you’re going to cut across the lines (AGAINST the grain), which breaks down the connective fibers and gives you super tender pieces of meat. HOW DO YOU TENDERIZE BEEF? In this recipe we’re tenderizing the beef 2 ways. First, we’re marinating the meat, which does more than just infuse the beef with great flavor… it breaks down some of the tough proteins in the beef. Secondly, we sliced the beef thinly, and across the grain, which breaks down the muscle fibers into much smaller pieces… yielding a super tender beef and broccoli! The rice is optional in this recipe, but I find it goes so well with the dish. You could also serve it on cauliflower rice for a lower carb option, or try my personal favorite, coconut milk rice! HOW DO YOU MAKE EASY BEEF AND BROCCOLI? It is easy to learn how to cook beef broccoli Chinese style. Flank steak is cut against the grain, then marinated in three simple ingredients at room temperature. This helps to tenderize and flavor the beef. While the meat is marinating, a homemade beef and broccoli sauce is prepared. This sauce is super flavorful, making this beef and broccoli recipe tasty as can be! Cook the beef, cook the broccoli, and cook the garlic and ginger. Then the magic happens, when everything is added together in this easy beef and broccoli dish. It’s that simple! 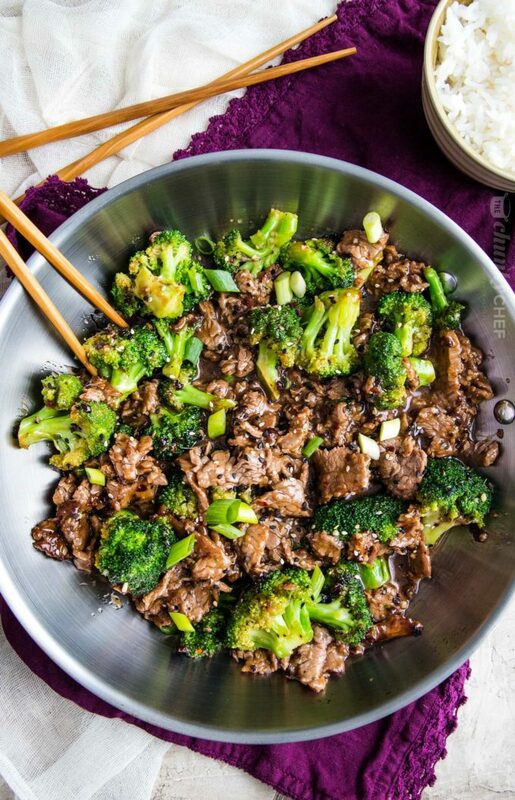 DO YOU HAVE TO COOK BEEF AND BROCCOLI IN A WOK? Absolutely not. If you have one, by all means, go for it! But if you’re like me, and just don’t have room for one in your kitchen pan arsenal, a trusty skillet works just as well. Normally I like to use my huge cast iron skillet, but for this one, I used my stainless steel pan. The only kind of pan you really don’t want to use is a non-stick pan, as you don’t usually get a good sear with those. Freeze the beef. It’s MUCH easier to slice flank steak thinly when the beef is partially frozen, so pop it in the freezer for 30-45 minutes before slicing! Prep ahead. 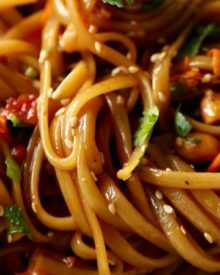 Stir frys are by nature, very quick cooking, which means it can get chaotic in the kitchen… and fast! So having all your ingredients ready to go is key. Make the sauce ahead of time, have your broccoli chopped into florets, etc. Leftovers are great. This meal is great for lunch the next day! So the next time you get a craving for classic Chinese food, put down that takeout menu. You can make your favorite meal in about the same time it would take for delivery… and you are in complete control of the ingredients, heat level, garnishes and more! Large skillet – if you don’t want a wok, this is a great alternative! Sharp knife – for the money, this is the best knife if you’re not wanting to spend hundreds of dollars! Just keep it sharpened, and it’ll last for a very long time! 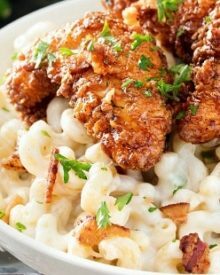 Recipe originally shared on Spend With Pennies where I contribute recipes monthly. In a small bowl, combine sliced flank steak with all marinade ingredients (1 tablespoon hoisin sauce, 1 teaspoon sriracha sauce, and 2 teaspoons cornstarch). Let sit at room temperature for 15-30 minutes (or refrigerate for up to 4 hours). Whisk together sauce ingredients in a mixing bowl and set aside. Gather all stir fry ingredients and set aside. The key to a great stir fry is preparation! Heat 1 tablespoon vegetable oil in large skillet over MED-HIGH heat. Cook beef in a single layer, 1-2 minutes, turning halfway through. If you need to, cook the beef in batches to avoid overcrowding the pan. Transfer cooked beef to a plate. Add 1 tablespoon vegetable oil to same skillet and add broccoli florets. Cook broccoli 1 minute, then add water and cover the skillet to steam the broccoli for approximately 2-3 minutes. Remove broccoli to a plate. If needed, add a small drizzle of vegetable oil to the same skillet, then add garlic and ginger. Cook 30 seconds, being careful not to burn the garlic. Add cooked beef and broccoli to the skillet and stir to combine. Whisk sauce ingredients again to make sure they're combined, then add them to the skillet. Cook everything 1-2 minutes, stirring nearly constantly, until sauce is thickened to your liking, and all beef and broccoli is coated. Remove from heat and sprinkle with green onions and sesame seeds if desired and serve. Can be served as is, or over white rice. For a saucier version, the sauce ingredients can all be doubled. Keep all other ingredients the same. So good! Best beef and broccoli I’ve ever made! Made it for the family and the loved it! Can’t have oyster sauce. What would be a good substitute? Would like to make this yummy looking recipe. Thanks. This dish is a winner! Looks like a fabulous weeknight dinner, so tasty and flavorful! A family favorite! Love making this for weeknight dinners! Homemade is always the best! This beef and broccoli dish looks heavenly! 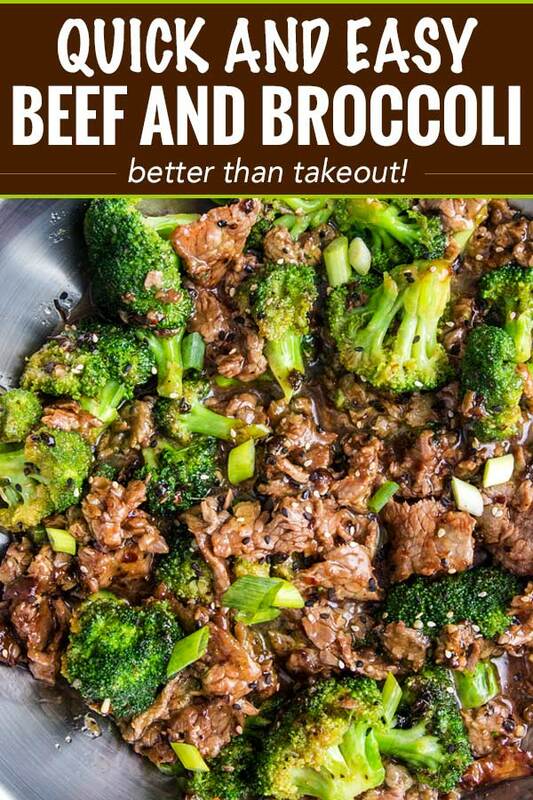 Beef and broccoli is one of my favorite take out dishes! Next time I want some, I’ll definitely try this instead! I love when I can eat in rather that eating out! this one is a must make! This looks so much easier than ordering out! Can’t wait to try this out soon. One of my favorite meals to make at home! Love it! This looks delicious!! It’s 10pm and I’m now craving Chinese, lol. Thanks for the tips on getting a good, thin slice for the beef.